YAHAD, FJC’s youth programming platform, is changing paradigms and squarely focusing on volunteering, learning and community activism this year. To boost these efforts, they’ve launched several new initiatives recently, as well as shifted the focus of its leading program EuroStars in the new season. 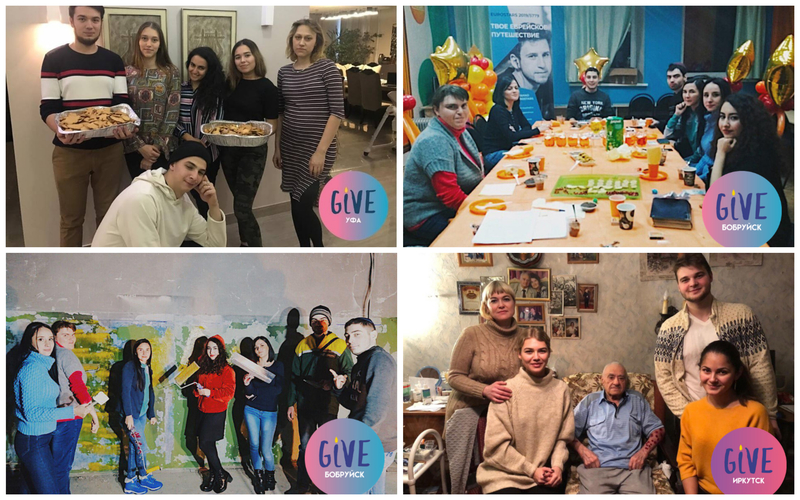 Last month YAHAD ran “volunteering week” throughout Russia and the FSU, which got 31 cities and over 500 volunteers involved in community mini-projects of wide variety. In Minsk, Belarus YAHAD activists offered their professional services to community members: painting, language classes, home repairs. In Nalchik, they visited solitary senior citizens and studied Torah with them; other projects were aimed at raising funds for books and furniture in community centers; holiday celebrations and care for the elderly. “Humanitarian help and volunteering is an important part of our activities and we try to instill the value of it in our young people as well. They may not always be able to help financially, but volunteering one’s time, skills and efforts is just as valuable,” said Mr. Alexander Boroda, FJC of Russia president about the initiative. YAHAD’s director Rabbi Mendy Wilansky agrees. “Volunteering is a new frontier for us and based on the tremendous positive feedback we received, we will be sure to create a lot more of this type of programming.” YAHAD is on the forefront of creating awareness of the importance of charity and volunteering in the region, Rabbi Wilansky said. Another project YAHAD launched recently is “Jewish Book-crossing”, a virtual book club in which books are listed online, recommended by friends and mailed throughout the region. There are about 30 Jewish books on the list for now, of all shapes and forms, from sacred texts with commentaries to comic short stories, biographies and fiction. “We want to get our youth leaders interested in Jewish literature, which has so much to offer,” said Miriam Mayorova, YAHAD’s informal education coordinator. The books, in all their variety, raise various Jewish identity questions and help formulate one’s sense of Jewish responsibility and awareness, she said. On a similar note, YAHAD’s popular project EuroStars is focusing more on learning and socializing this year. The destination of the trip to Europe, which is the prize for those who’ve attended over 85 percent of weekly classes and proved their involvement, remains unknown. “It’ll be a surprise destination, which also helps to shift the focus more onto yearly learning and socialization activities as opposed to trip excitement” Ms. Mayorova said. This year almost 1,000 students are expected to participate in the journey.